I took a walk in Mill Creek Ravine with my twin brother a couple of days ago. He was in Edmonton on a business trip so we happily had a rare chance to visit. My brothers (I have three) and folks have, for a long time, been concentrated west and southwest of Toronto. My wife and I, on the other hand, have been a bit more nomadic living on the west coast and in the southern hemisphere. That means we don’t see family nearly as much as we’d like so, it’s always a treat when I get to see them! 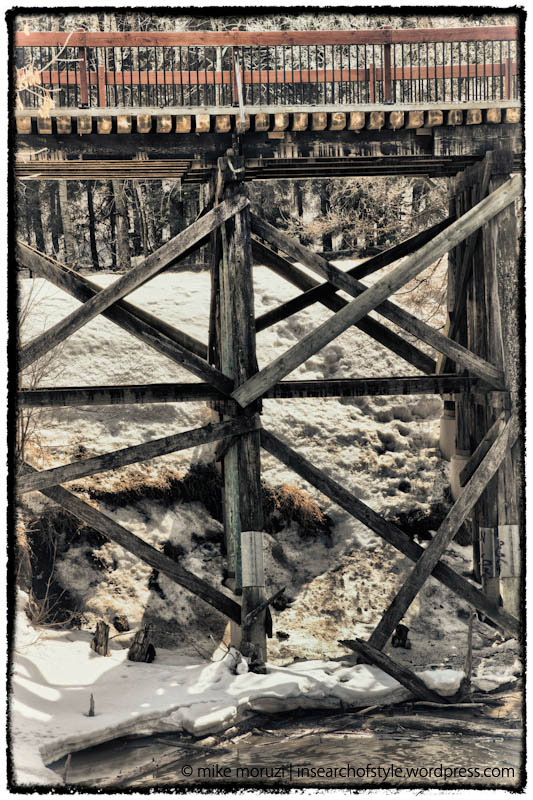 The picture above is the Mill Creek Trestle Bridge. It currently serves as a pedestrian bridge in the Mill Creek Ravine Park in Edmonton, but it was originally a rail bridge when it was built in 1902. It supported one of the first rail lines into the city. Processing notes: I tried out HDR Efex Pro to process three bracketed (-2EV, 0EV, +2EV) shots of the bridge. I’m still experimenting with HDR Efex Pro so I’m not yet ready to decide if it’s better than Photomatix or not. One thing HDR Efex Pro has is a lot more presets to try out. This picture is based on a preset called Granny’s Attic. I fine tuned the settings, then brought it into Viveza to fine-tune the colour of the red(ish) railing to something I was happier with. I also added a bit of texture and tweaked the brightness in various spots. Lastly, I used Silver Efex Pro to add a slight white vignette and the border. 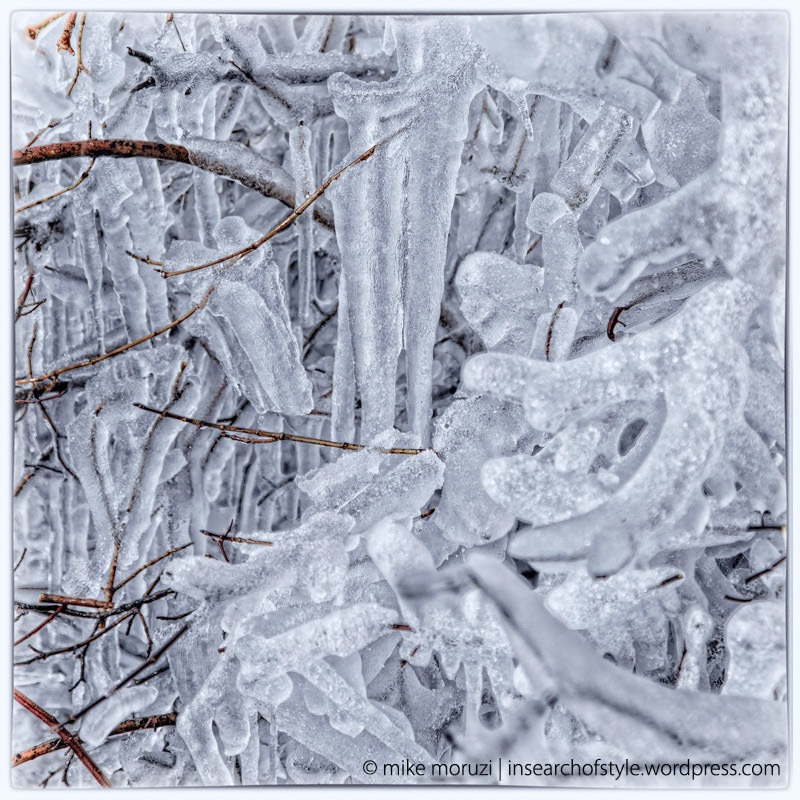 A few days ago, I posted a picture of icicles down by the North Saskatchewan river. They were fresh beautiful clear crystals formed from melting snow dropping off the High Level Bridge and catching on the trees below. 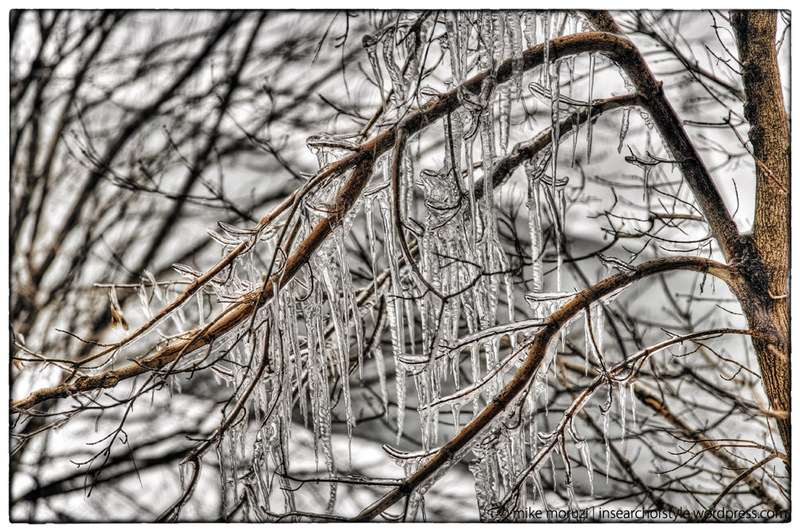 The last few days, we’ve been enjoying above-zero temperatures and those icicles have collapsed into a big mess at the bottom of the same trees. The crystal clarity they previously had has given away to this thick, slushy look that happily spells their demise. That’s right! This snow and ice stuff is finally, after five long months, melting! Process notes: I processed this as an HDR image from 5 bracketed exposures (-2, -1, 0, +1, +2) using Photomatix Pro to combine and tone map the result. I brought the image into Photoshop CS3 and applied the Tonal Contrast filter in Color Efex Pro 3 (Nik Software) to bring out the details in the ice. I then converted it to B&W using Silver Efex Pro 2. In Silver Efex, I added a blue tone to the image, selectively restored colour to the branches, add a soft white vignette and added the border. 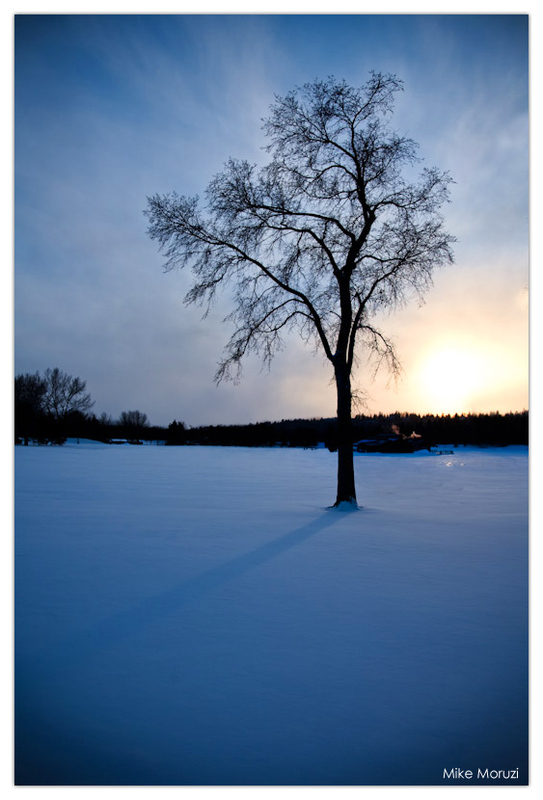 I’m taking a brief break from my heritage sites theme today to share an image of “spring” in Edmonton, Alberta. Many of the photo blogs I follow are posting happy spring time pictures – flowers in bloom, rivers full and flowing – but not here in the centre of Alberta. While the vernal equinox has come and gone, we’ve not taken notice of the traditional date for the arrival of spring in the northern hemisphere. This being our first winter in Edmonton, we have been expecting an extended winter so this delay in spring is no surprise. 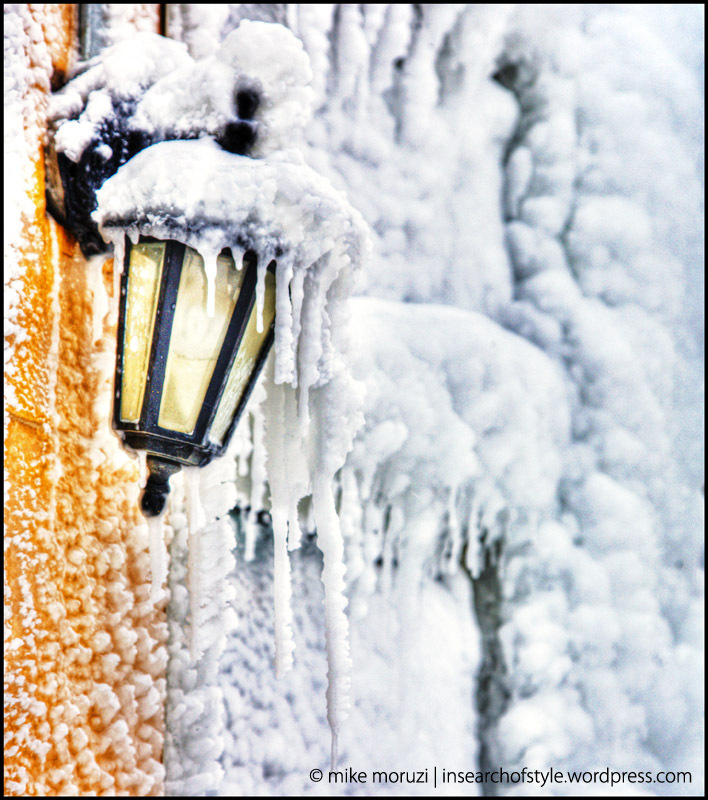 We knew we were in for a long, cold winter, but how long will it last? At first, winter was fun – there was snow, skiing, snow forts, sledding. After about three months, we started getting a bit tired of winter. That was two months ago. On the bright side, temperatures are finally creeping above 0C, there’s not nearly as much snow falling, and the local ski hills are still open! I found these icicles formed from melting water falling from the High Level Bridge. The dark diagonal swath in the background is the North Saskatchewan River which flows fast enough that it’s only frozen over in extreme cold. In a way, I guess this picture does represent spring. Since I began this blog, I’ve wanted to capture in a photo, the cold temperatures that weigh so heavily on winter here in central Alberta. Simple pictures of snowy scenes don’t capture the cold for me since a -30C winter landscape looks much like a -5C winter landscape. There’s some irony that it took fire to help me visualize cold. What do you think? Do yesterday’s and today’s pictures finally show “cold”? This is a follow-up to yesterday’s post about the fire on 118th Avenue in Edmonton. This building shared a wall with the one that was consumed by fire. It appears untouched by fire and now sports a new winter shell. The extreme cold that Edmonton has been enjoying does little to prevent fires but it makes the fires much harder to put out. Yesterday, there was a fire on the north side of the city. Thankfully it was an unoccupied, commercial structure so no one was hurt in the fire. Unfortunately, it was a heritage listed site so a bit of Edmonton’s history was lost. The fire occurred early in the morning while the temperature was hovering around -30C. The extreme temperature makes it very hard for the fire fighters. 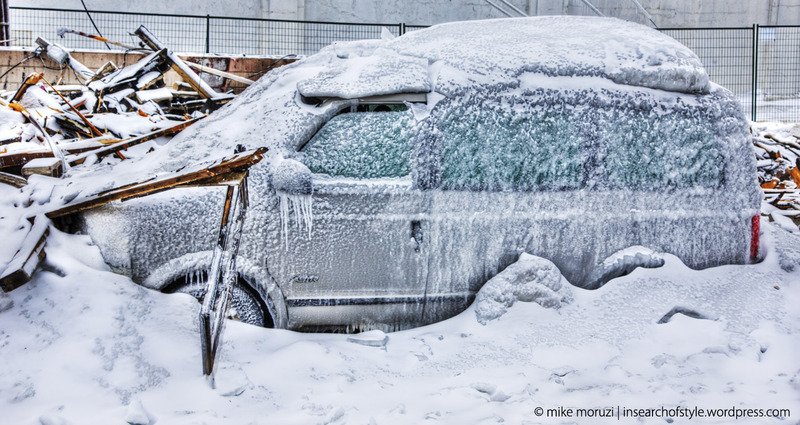 Not only do hoses freeze hampering their efforts, but the cold and wet puts the fire fighters at risk. They work in short 30-minute rotations to protect themselves from frostbite. The last time there was a major fire in these temperatures they had to bring in steam trucks to free the firetrucks from the ice that had formed while fighting the fire. You can see why when you visit the aftermath of this fire. The whole area is covered in piles of fresh ice from the lamp poles, the road cones and the sidewalk to the power lines, trees and the charred remnants of the building. As you can see in the picture, there was also a vehicle at the site. While it appeared untouched by the fire, it looks like ice might be a bit of a problem, especially when you see that the driver’s window is slightly open. I wonder what it looks like inside. While Melbourne is cooking at nearly 40C, here in Edmonton it is a freezing -30C. It’s very quiet outside, with the cold almost seeming to freeze the sound. The snow that was so great for snowballs last week is now hard as a rock. 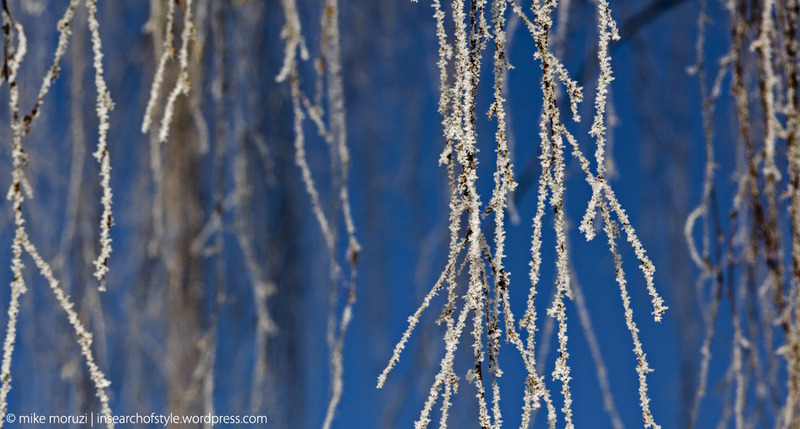 The trees are coated with frost and the branches appear white. The exhaust from cars hangs in the air and makes it difficult to breath. Everyone has their collars turned up, their faces covered, and their heads down as they minimize their time outside. The kids don’t get outdoor recess when it’s this cold. Our energy bills are spiking as heaters battle the bitter cold. All while Melbourne’s energy bills are spiking as air conditioners try to push back the heat.